Note: This tutorial assumes that you have completed the previous tutorials: understanding ROS nodes. Description: This tutorial introduces ROS topics as well as using the rostopic and rqt_plot commandline tools. roscore cannot run as another roscore/master is already running. This is fine. Only one roscore needs to be running. Now you can use the arrow keys of the keyboard to drive the turtle around. If you can not drive the turtle select the terminal window of the turtle_teleop_key to make sure that the keys that you type are recorded. Now that you can drive your turtle around, let's look at what's going on behind the scenes. The turtlesim_node and the turtle_teleop_key node are communicating with each other over a ROS Topic. turtle_teleop_key is publishing the key strokes on a topic, while turtlesim subscribes to the same topic to receive the key strokes. Let's use rqt_graph which shows the nodes and topics currently running. Note: If you're using electric or earlier, rqt is not available. Use rxgraph instead. If you place your mouse over /turtle1/command_velocity it will highlight the ROS nodes (here blue and green) and topics (here red). As you can see, the turtlesim_node and the turtle_teleop_key nodes are communicating on the topic named /turtle1/command_velocity. The rostopic tool allows you to get information about ROS topics. Let's use some of these topic sub-commands to examine turtlesim. rostopic echo shows the data published on a topic. Let's look at the command velocity data published by the turtle_teleop_key node. You probably won't see anything happen because no data is being published on the topic. Let's make turtle_teleop_key publish data by pressing the arrow keys. Remember if the turtle isn't moving you need to select the turtle_teleop_key terminal again. Now let's look at rqt_graph again. Press the refresh button in the upper-left to show the new node. As you can see rostopic echo, shown here in red, is now also subscribed to the turtle1/command_velocity topic. rostopic list returns a list of all topics currently subscribed to and published. This displays a verbose list of topics to publish to and subscribe to and their type. Communication on topics happens by sending ROS messages between nodes. For the publisher (turtle_teleop_key) and subscriber (turtlesim_node) to communicate, the publisher and subscriber must send and receive the same type of message. This means that a topic type is defined by the message type published on it. The type of the message sent on a topic can be determined using rostopic type. rostopic type returns the message type of any topic being published. Now that we know what type of message turtlesim expects, we can publish commands to our turtle. Now that we have learned about ROS messages, let's use rostopic with messages. rostopic pub publishes data on to a topic currently advertised. The previous command will send a single message to turtlesim telling it to move with a linear velocity of 2.0, and an angular velocity of 1.8 . This is a pretty complicated example, so lets look at each argument in detail. This option (double-dash) tells the option parser that none of the following arguments is an option. This is required in cases where your arguments have a leading dash -, like negative numbers. As noted before, a geometry_msgs/Twist msg has two vectors of three floating point elements each: linear and angular. In this case, '[2.0, 0.0, 0.0]' becomes the linear value with x=2.0, y=0.0, and z=0.0, and '[0.0, 0.0, 1.8]' is the angular value with x=0.0, y=0.0, and z=1.8. These arguments are actually in YAML syntax, which is described more in the YAML command line documentation. As noted before, a turtlesim/Velocity msg has two floating point elements : linear and angular. In this case, 2.0 becomes the linear value, and 1.8 is the angular value. These arguments are actually in YAML syntax, which is described more in the YAML command line documentation. This publishes the velocity commands at a rate of 1 Hz on the velocity topic. rostopic hz reports the rate at which data is published. Note: If you're using electric or earlier, rqt is not available. Use rxplot instead. in a new terminal. In the new window that should pop up, a text box in the upper left corner gives you the ability to add any topic to the plot. Typing /turtle1/pose/x will highlight the plus button, previously disabled. Press it and repeat the same procedure with the topic /turtle1/pose/y. You will now see the turtle's x-y location plotted in the graph. Pressing the minus button shows a menu that allows you to hide the specified topic from the plot. 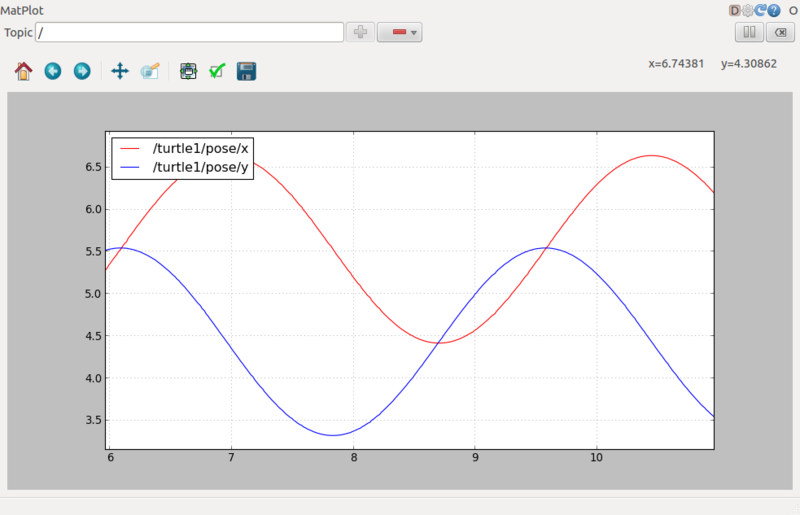 Hiding both the topics you just added and adding /turtle1/pose/theta will result in the plot shown in the next figure. That's it for this section, use Ctrl-C to kill the rostopic terminals but keep your turtlesim running. Now that you understand how ROS topics work, let's look at how services and parameters work. The following video presents a small tutorial using turtlesim on ROS nodes and ROS topics (complete videos are available in my Udemy Course on ROS).